Knowledge, that has been passed down through our families generations allows us to provide all types of dry cleaning service from our shop in Esher, to our mobile collection service. We ensure every item is laundered to the highest standard and use the latest equipment to provide a professional finish to your clothes. Reliable dry cleaning services for the fast, accurate, top quality results. We are able to clean all clothes and provide a great stain removal service. 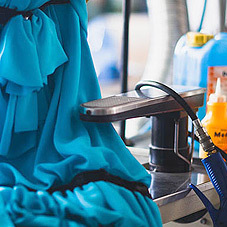 For all your items that do not require dry cleaning, we also provide a regular laundry service. We provide a collection and delivery service where we will collect your dirty clothes at the allocated time, dry clean them and then return to you ready to wear.